Single Topic Emails: Such emails are sent based on location in the city or sectoral interest. Our Member Liaison staff: The Member Liaison Team are in constant contact with members on the ground. The “Meet the Business” scheme: where member businesses have the chance to brief your DublinTown Ambassadors. 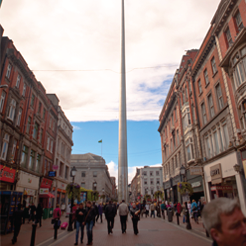 To arrange a “Meet the Business” briefing contact Cathy O’Donnell at cathy@dublintown.ie or call 01 633 4680.